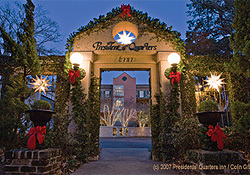 The Presidents' Quarters Inn is an Historic Bed and Breakfast Inn featuring 16 overly-spacious rooms and suites in the heart of Savannah, Georgia's downtown Landmark Historic District. Two adjoining 1855 mansions have been transformed into a stately, restful, and intimate inn that marries 21st century amenities with old world elegance. Overlooking Oglethorpe Square, Presidents' Quarters Inn is acclaimed as a place where generals, governors, politicians and business pioneers have shaped Savannah's and the nation's history. 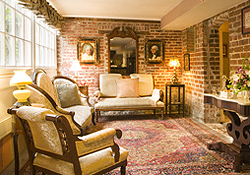 Each one-of-a-kind guest quarters is named to honor a U.S. President who visited Savannah during his presidency. 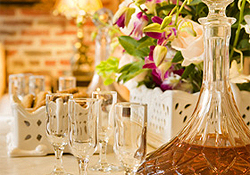 A shaded courtyard, free on-site parking, balconies and private entrances at street level, wireless access, and complimentary afternoon wine and hors d'oeuvres are just a smattering of the inn's amenities, assuring that every guest's Savannah experience is extraordinary. A short walk to Savannah's favorite restaurants, shopping, and the theater district. Fresh fruit and beverages on arrival. Afternoon wine and hors d'oeuvres featuring savory recipes from Savannah's favorite chefs. 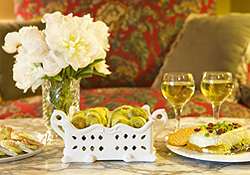 Luscious homemade cookies or southern pralines accompany nightly turndown service. Front door, street-level assistance with your luggage. A southern, prepared-to-order breakfast served daily in the parlor or in the garden courtyard. An extensive lending DVD library. An extensive lending video library. Elevator service to all floors. Flat screen televisions in most rooms and suites. Full wheelchair access in ground floor rooms; wheelchair friendly access in upper floor rooms and suites. Well-informed Concierges assisting with best-of-Savannah insider recommendations/reservations for lunch and dinner dining, plus call for transportation, cultural tour, sightseeing reservations, and other Savannah entertainment activities.